Wish, the e-commerce startup that specializes in discounts and mobile shopping, raked in over $1 billion in revenue for the first time in 2017, CEO Peter Szulczewski told CNET. And, after doubling revenue in every year of its existence — it was founded in 2010 — Szulczewski says Wish is on track to repeat the trend in 2018. The startup has also attracted 75 million monthly active users as of April, has more than 1 million merchants on its marketplace, and boasts a product selection that’s eclipsed 200 million items. Wish’s performance and estimated valuation of $8.5 billion are built on its discounted prices. The platform is discount-focused, with many products being advertised as 90% off or more. It manages these steep discounts by selling products directly from manufacturers and having potentially month-long shipping windows, among other methods. To try to profit from this model, Wish takes a percentage from each sale. The marketplace seeks to leverage its extremely low prices by driving impulse purchases: It displays products’ discounted prices next to the significantly higher, supposed original prices, shows how many other consumers also bought a product, and can also exclaim that the product is “Almost Gone!” to push consumers over the edge. These tactics can lead consumers to make purchases they weren’t planning on, giving Wish a consumer base of impulse buyers and extremely price-conscious consumers who want and need low prices. 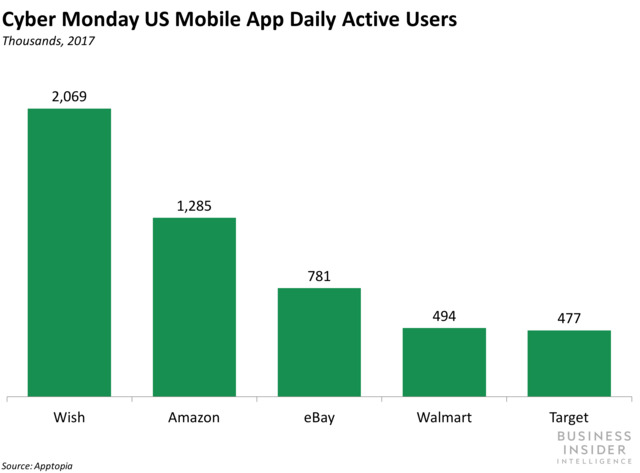 The startup has managed to outperform the likes of Amazon and eBay on mobile, and they’ve taken notice.Wish has the top free shopping app on the Google Play store, and drew in over 2 million daily active users (DAU) on Cyber Monday, dwarfing Amazon’s 1.3 million and eBay’s .8 million. To avoid being overtaken by the startup and its low prices, both e-tailers have launched discount sections on their marketplaces — Amazon’s “$10 & Under” and eBay’s “Under $10.” These new offerings don’t appear to be hurting Wish at the moment, given Szulczewski’s expectation that Wish will again double its revenue, but established e-tailers may further invest in their discount and mobile businesses to take on Wish. Szulczewski plans to invest in improving Wish’s logistics, personalization, and selection, which should help it hold off competitors. Even if they can’t match Wish’s prices consistently, established e-tailers like Amazon are in a position to offer faster delivery, a more customized experience, and more products. But if Wish puts the $1.3 billion in funding it’s raised — much of which the CEO says the company hasn’t spent — toward these areas, Wish will be difficult to take down.